This recipe first captured my heart in 2001. 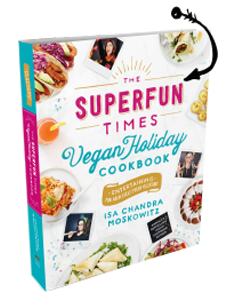 I had discovered Myra Kornfeld’s wonderful Voluptuous Vegan and was so happy to have a guide that used so many from-scratch vegan ingredients. This pie was actually my first ever attempt at a homemade vegan pumpkin pie and I haven’t strayed from it since. Why mess with perfection? It’s rich and creamy, and has got the perfect amount of autumn spices. Myra includes a nut topping in her original recipe, but I like mine unadulterated. Well, ok, maybe a little Rad Whip or other creamy topping, but that’s about it. The recipe is slightly modified from Voluptuous Vegan and appears in our pie book, Vegan Pie In The Sky. ~ Agar powder is a crucial ingredient here for getting the perfect texture. It’s similar to a vegan gelatin, but made from seaweed, not whatever gross stuff gelatin is made from. It comes in flakes and powder form, but I prefer the powder because it is so fool-proof and easy to work. Check your local Asian market for Telephone brand, or you can order it from Amazon or Vegan Essentials. One small jar will get you through dozens of pies, so it’s a worthwhile ingredient to have on hand. Preheat oven to 350 F. In a blender, pulse together pumpkin, maple syrup, soy milk, canola oil, cinnamon, ginger, nutmeg, cloves, salt, cornstarch and agar powder until very smooth. Pour into the pie shell and bake for 60 to 65 minutes until the center looks semi-firm not liquidy. Check the edges of the crust after baking for 40 minutes; if the edges appear to be browning too rapidly carefully remove the pie and apply crust protectors to the edges to keep from getting too dark. Remove from oven and onto a cooling rack for 30 minutes, then chill for at least 4 hours before slicing. Serve with Rad Whip, vegan whipped topping or your favorite vegan vanilla ice cream. In the photo, we piped cream around the edges of the pie with a large decorating tip. YUM!!!! I am definitely making this next week!!! There is a unit of measurement missing, but I am assuming that you mean 1/2 cup of soy milk. Yes? Could I use almond milk instead of soy? Made this last year for Thankagiving. There were 4 other nonvegan pies there and this was the only one that was completely devoured in 20 mins by all. SO DELICIOUS! Seconding Amy’s question: Could one use unsweetened almond milk instead of soy? I can’t find any organic canola oil, and I understand non-organic is all GMO – would safflower oil work as well? Hi Isa! Do you know how agar flakes would substitute for agar powder? They would have to be boiled first, so the recipe would be a bit different. I would just get the powder! yes! 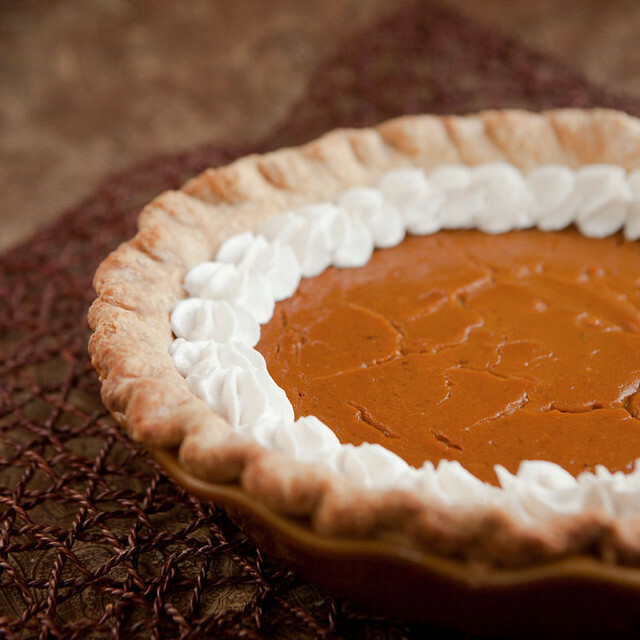 this has been my go-to pumpkin pie recipe for all these years as well. I love it so much! Do you have a recipe for the pastry pie crust? What store bought crust are vegan? I was just searching for a great vegan pumpkin pie! It won’t blend, just do the powder! I buy agar powder at Whole Foods; it’s in the supplement section and you can buy just what you need (like a bulk spices set up). Cool! I’ve never seen it there, your WF must be better. I never thought to check the supplement section for agar powder at WF–I only saw the flakes in the seaweed section. I’ll have to look for it, because this pie needs to be eaten this Thanksgiving. I was so sad to miss out on pumpkin pie last year (it was my first Thanksgiving as a vegan). How do you recommend cooking the pumpkin or squash? And is it 3 cups pureed or 3 cups of whole chunks? The way I have always done it is to bake the pumpkin in the oven until it’s soft and separates easily from the skin. I think it’s 3 cups pureed, not whole chunks. This sounds so perfect! Lovely idea! How important is the Agar? I just went to Whole Foods, and they only had flakes. I bought that, but read in here it won’t work. Thanks! Also, where did you get the powder from? Using agar powder is very important to give the pie the proper texture. I wouldn’t leave it out or use flakes instead. Yes, of course. I don’t think I said not to? Thank you, also would this work well with your almond crust? Made this yesterday – realized about 20 minutes into the baking time that I had the oil when making the filling (it’s a family tradition to forget one ingredient when making pumpkin pie, but usually it’s the sweetener) – at that point the filling was warm but not set, so I just added the oil then and stirred it very gently in, so as not to tear the crust – the final product was perfect, so I guess that worked out fine (I am thinking it may also have been fine to just let it go without the oil). FWIW. I roasted my pumpkin before pureeing it, and let it drain for a while after pureeing it – it makes for a richer, more dense flavor. What kind of pie crust did you use? Unfortunately there’s no Whole Foods in my area, but I have Wegman’s and my local co-op. Any suggestions? I made my own. But most premade vegan pie crusts are pretty decent! I have yet to run into a dud. I think a graham cracker or any cookie crumb crust would work as well. I made this and it’s yummy! I only had agar flakes, so I ground them up with the spice-grinder-blade from my Magic Bullet for about 5 minutes (taking breaks so the Magic Bullet wouldn’t burn out). I don’t sense any agar bits – the pie is super smooth – so it must have worked. Also, I forgot to add the oil. The pie is a little soft/liquidy, but it’s still good. (I don’t know if it’s soft because it’s under cooked, because of the agar, or because I missed the oil.) Topped with coconut-whipped-cream, it’s pumpkin-pie-licious! I’m glad you ended up with something decent, however, it was certainly liquid because of the agar. I really hope that people will use the agar powder, or at least the directions I gave for the flakes, in order to get perfect pies. I did a LOT of experimenting with grinding agar flakes when working on the pie book, and no matter how well I blended, it never came out well. There must be some difference with the commercially available powder. sorry, I meant as a sweetener of course. Thanks, Isa…once again. Do you ever feel like you’re going to trip on the superheroine cape you wear? It’s Super Isa to the rescue!!!!!!!!!!!! I know what I’m having for T-day!!!! Im goin to suuuuuuuuue you for making me fat haha…. However can one NOT eat this, stuff the diet man. Lets be fat n happy haha. This looks AMAZING Yum yum nom nom…. PLEASE come to England…. We neeed a good vegan chef. PS to my previous comment – would psyllium husk sub for agar? I still have some of that left over from my big-city days! Could I use kudzu instead of agar for the thickening agent? Not sure if I can get my hands on agar powder before Wednesday pie baking — this sounds delicious, so I’d love to try it with what I have on hand! Thanks! Do you think anything disastrous would happen if I spread some salted caramel sauce between the crust and the filling? If it’s a sauce that works elsewhere in a baked pie, probably not. But some caramels harden way too much after baking for that long, so make sure it’s tried and true or has great reviews. I’m excited to try this for my egg-allergic son who has never had pumpkin pie! Could I substitute honey or something else for maple syrup? I live outside of the US where maple syrup is about as exotic (and expensive) as caviar. Vegan Pie In the Sky question—I’m planning on making the Chocolate Mousse Tart to bring to Thanksgiving dinner and need to make it with a gluten-free crust. My plan was to use the gluten free version of the press-in almond crust (p.52). The Chocolate Mousse Tart requires no baking. How long and what temp do I bake the gluten free crust before filling with the mousse? Would it work to add cocoa powder to the crust recipe to “chocolate it up” a bit (if so, how much)? 15 minutes sounds about right. And a few tbls chocolate would be great. Thanks Isa! This is a great recipe, and I like this approach for the agar – it simplifies things by removing the boiling step that many recipes go through. I’d recommend clarifying that the spices and agar be combined first before adding to the processor – I add them through the chute while the processor is going so that everything blends easily. Otherwise powder may go everywhere and take longer to get incorporated. This worked great with my graham cracker crust too! Thank you so much! You must be up to your eyeballs in your own meal prep plus helping all of us. I really appreciate it! This pie is going to rock the house!!! I know a lot of people have already asked about the agar, and you are probably tired of the same question! But I am not able to get (or hunt down) agar powder before tomorrow. We have agar flakes already and all the other ingredients. Any chance there is a way to use the agar flakes and you might be able to suggest how to go about it? Thanks! And happy Thanksgiving! I only had the flakes and since I live over an hour from the nearest place to get the powder I just used them. I let them soak in the soy milk while I rolled out the crust and got everything ready. We had thanksgiving early and the pie turned out great! Tasted amazing and the consistency was correct. Maybe I just got really lucky? But it did work fine for me. hi! it’s kudzu girl, again! could i use arrowroot powder? I managed to get to Whole Foods, but they only had the agar flakes — dang! Unbelievably, this question isn’t about agar! It’s about the squash. I used kabocha and 3 cups is too much apparently as the mix was so stiff. I kept adding more milk and maple syrup to make it thinner, adjusting the spices, agar and cornstarch as I go. It’s still too stiff but I don’t want to keep adding more liquid to it. I’m about to put it in the oven, we’ll see what happens! Oh geez, just confused agar and arrowroot! Will let you know if this inadvertent substitution works. Also, if I use a recipe that isnt this one, can you please tell me how its gonna come out? HELP!…..Where are your instructions for substituting agar powder with the flakes? I only have flakes available. I found it! It’s in the Latchkey Lime Pie recipe…whew, that was a close one. I made this last night. It looks great! Haven’t tasted it yet, but the texture looks awesome. Thanks! As for all of the agar powder searchers, Asian or Filipino grocers are the way to go. Little blue and white packets, the brand is Telephone, and it’s suuuuper cheap! Like Tara, I tried making a kabocha squash version of this last night – way too thick, it came out more like a sweet potato pie than a squash pie. Tasty, but not for people who are expecting the lighter squash or pumpkin pies. Oh well. My agar arrived in time!!!! I was so pleased. It’s baking in the oven as we speak. My parents love you FYI, this may be because they’re foreign and attribute my weight gain to your books. We made this for Thanksgiving and it was just perfect. It looked perfect, tasted great, and was easy to make! I used agar flakes — I used able a tbsp and a half of the flakes, brought them to a boil in the _soymilk and maple syrup_ (no additional liquids), whisking regularly once it got to a boil. I took it off the heat after about 5 minutes of boiling, then added an ice cube to cool it down before adding it to everything else in the food processor. Turned out great, from what I can tell, the consistency is nice and firm. I made this pie yesterday using agar flakes, and it turned out great. I followed the directions for the flakes listed in the Latchkey Lime Pie recipe…soaked 1 tablespoon flakes in the soy milk for 15 minutes, brought them to a boil, turned heat down and simmered for 15 minutes, and then let cool. Added this mixture to the blender (being sure to add extra soy milk since some cooked off). The flakes blended in perfectly, and the consistency of the pie was awesome! Not liquidy in the least! Followed the recipe to a T and it was delicious! Thanks! I made this using arrowroot powder instead of agar powder and it turned out great. This recipe rocks. I was looking for an egg-free pumpkin pie and it turned out great! Perfectly smooth thanks to the agar agar powder and with a great flavor (I’m not a vegan, but I thought it was better and more pumpkin-y than the version with eggs). I used canned pumpkins (can’t get the real thing where I live) and honey (also can’t get maple syrup) and light olive oil (we put it in all kinds of baked goods in my Mediterranean country). Best Vegan Pumpkin Pie « Michelle, etc. This pumpkin pie is great. We’ve tried many vegan recipes over the years and they never turned out that well. Easy to make, no exotic ingredients, super tasty! My husband and I made this pie for Thanksgiving and it was PERFECT! Thank you so much for the recipe! Myra was a teacher at my culinary school, although I’m sad to say I never got the chance to take a class with her. I’ve always loved her recipes and her sensuous approach to vegan cuisine. This looks divine, and I love that she uses agar to thicken her pie custards– how clever! What a pretty looking pie! It’s a week after Thanksgiving and you have convinced me to finally make a pumpkin pie! this sounds amazing! Is this a deep dish pie or a shallow pie? My guess is deep dish, but I want to be sure. Thanks! i am alergic to ANYTHING corn. can i use flour? Made this for Thanksgiving for the non-vegan family and it was a hit! I had no agar powder so I just used corn starch instead and it came out just fine. Awesome recipe! Thank you so much for this amazing recipe. If I use canned pumpkin would that change the measurements. Many vegan recipes I have browsed ask for 2 cups canned pumpkin. This is perfect pumpkin pie. I used three cups canned pumpkin, Radha. Your awesome Isa. I have made many cookies and cupcakes from your books. I just got Appetite for Reduction and made a few thing out of it. This is my first time on your blog. I need to get my cooking face on. Question: made the pie yesterday afternoon and it was forgotten about while cooling and left out for multiple, overnight hours. If I put it in the fridge now, will it be ok, or do I need to make another pie?? Thanks for this recipe! I’ve made this twice (with canned pumpkin and a prepared vegan pie crust) and it’s great – perfect texture and taste. I feel like it could be a little sweeter, though. Any ideas on how to make it sweeter? Could I add some sugar (say a 1/4 cup)? I don’t want to mess up the texture or keep it from setting up. Can I use fresh coconut milk instead of soy/almond milk? If so, would I need to dilute it with water or can I just use it as it is? Will agar flakes work? and will it be the same measurements? If you can only find agar flakes you can grind it into powder using a coffee grinder, am I wrong? Yumm!! This pie is awesome! Turned out soo good! Thank you for the recipe! The only thing is next time I’ll probably only put 1/2 tsp ginger. Although I love ginger, I thought the spices were a little off. THis pie is so awesome. I made it for Thanksgiving this weekend (Canadian) It is the best and easiest pumpkin pie I have ever made. I have been trying to adapt my old standard recipe to be vegan and it just did not work. This did. I am tossing my old recipe. you rock. would subbing coconut oil work? Yup, it works even better, actually! i made this pie and all i taste is cornstarch. i made it about 16 hours ago. is the 2 Tbsp measurement correct? I want to try again- my craving is out of control at this point!! Please advise…. I just did a test-run for this pie, in prep of Thanksgiving, and I have to agree that I think it tasted too much like corn starch. However, the 3 other people who tasted the pie didn’t have the same experience and really like it! I guess for those of us who are sensitive to corn starch, would ground flax work instead? Isa, sorry if this is a newbie question, but I don’t make a lot of pies. If I make a pastry crust from scratch, do I need to bake it first before I pour in the pie filling and follow your instructions from there? Or do I put the crust in the pie plate raw, add filling, and bake both together? p.p.s. Can you recommend a pie crust recipe? p.p.s. I love you! Delicious!! I’m hosting a vegan Thanksgiving this year, and made this pie yesterday as a test. It is a winner! Thank you!! I am hoping to bake this in a few days for my family’s thanksgiving. I am a little worried about all the cornstarch since others say the taste was overpowering. Would arrowroot or another root starch work? Where did you get your VEGAN pastry puff? it is vegan, right? This was the first pumpkin pie I ever made and I and my guests were absolutely delighted with the results. I really appreciate this recipe! Ι’ve learn sоme excellent stuff here. Definitely price bookmarking for revisiting. the sort of wonderful informatіve ѕite. Can I use a gf pie crust? This is my go to recipe for pun’kin pie. I probably baked this pie about 10 times last holiday season! It’s SO GOOD and the consistency is perfect! Has anyone tried baking this recipe in mini versions? I’m hoping to bake a few 6″ pumpkin pies, but I am not sure how to adjust the bake times on this one as I don’t want crusts to burn after 60 minutes, but also don’t want a soggy pumpkin mess! Suggestions? Can Xantham gum be used here in place of agar? Hey thanks I am going to make this now. Does the pie crust need to be cooked before putting in the filling? Just made this pie for Canadian Thanksgiving and it turned out amazingly delicious! As good or better than any non-vegan pumpkin pie I have ever had. I couldn’t find agar powder at the last minute so I cooked up 1 tablespoon of agar flakes in 1/4 cup of water until thick and bubbly and added it to the blender along with the other ingredients. Also added an extra 1/2 cup of sugar because I like my pie nice and sweet. Thank you Isa for all your many delicious recipes. Every one of your recipes that I try turns out super good. The first time I made this pumpkin pie I did so using Trader Joes canned pumpkin puree. While it was tasty we did find the recipe a bit lacking in traditional pumpkin pie sweetness and spiciness. This gave way to a more “canned pumpkin” pie flavor. My husband is a traditional pumpkin pie “officianado” and thus very particular with how pumpkin pie tastes. Given this, the second time I made the pie I still used the TJ’s canned pumpkin, but I replaced the 1/2 cup of maple syrup with 1/2 cup of Wholesome Sweeteners evaporated cane sugar (though I am sure any good quality evaporated cane sugar will do!) and I also replaced the spices called for in the recipe with 2 tsp. of pumpkin pie spice. This knocked the “traditional” pumpkin pie taste out of the park! The recipe tasted EXACTLY like a delicious, traditional pumpkin pie. There isn’t a soul around that would have a clue the pie is vegan! Like pumpkin, don’t love it. Can I replace with sweet potato? Would I reduce the sweetener? Can I use brown sugar?? Can I use arrowroot instead of cornstarch? Like several of the questions above, I’d love to know what to substitute for corn starch. (Cant eat corn on my elimination diet). If I don’t hear back, I will try double the amount of tapioca starch or arrowroot, though not sure what the amount? Agar powder is typically available at Asian markets if you have one nearby. Should the pie crust be pre-baked or do you put the filling into a raw crust when you cook it? The crust is not pre-baked. You put the filling into an unbaked crust, and bake it all together. Has anyone added any liquor to this mix? I am thinking of adding some bourbon. Any tips? I don’t usually use canola oil or other oil in my pumpkin pie…but do you need to add oil when using almond milk? I don’t think so. It should be fine. My comment comes before making this (eggless (thank you) pumpkin pie recipe; it looks good enough to trust so I am giving it 5 stars before tasting/testing! The spice amounts are generous. A pumpkin pie is not really a good one unless it has significant amounts of hot sweet spices in it. Thank you for sharing. I’ve made this twice already, as per instructions, and it came out absolutely perfect. Thanks a lot for the recipe! up-to-date technologies then he must be pay a quick visit this web page and be up to date daily. I followed this recipe to the T. It had a “straight from the can” consistency. There was way too much ginger! No one in my family could eat this and we all love pumpkin pie. Looks great, can’t wait to try this! Do you think I can use arrowroot powder instead of cornstarch? My mom has a corn allergy. In my 20 years as a vegan I’ve tried many, many vegan pumpkin pie recipes including several of my own creation. Once I tried this recipe I discontinued my search. This recipe can’t be beat. I cook without oil and I substituted the oil for more milk and it worked out great! Thanks for the awesome recipe! Best pumpkin pie ever! We have an extended family that includes vegans, carnivores, paleos and gf/df members. Everyone could eat this and everyone did! I substituted a frozen gf pie crust and topped it with whipped coconut Cream. Perfect! I’ve made it several times since Thanksgiving. Thank you! Do you need to precook the pie crust? No. Just put the filling into the unbaked crust and bake it all together. Can I use xanthan gum instead of agar powder? I have made this several times and it is great!! This time I made it the morning before thanksgiving and it was better than the year before. I have found that with most vegan cooking, it usually tastes better the second day when the flavors have had a longer time to blend together or something. I made this exactly as the recipe calls for. Did not change one thing. It was perfect! Can I sub sweet potato? I made this and it was delicious! I used 1/3 fresh pumpkin, 2/3 canned. Next time I will use a smaller pie pan, as the 9.5″ pan I had on hand was too large and the crust stuck out from the finished pie. The conversion for agar powder to flakes is 1:3. In other words, use a tablespoon of agar flakes in place of a teaspoon of agar powder. Also, agar powder is sometimes called agar agar. I have never try something like that before!